The word in Sanskrit means "wheel" or "disk." The concept comes to us from Hindu and Buddhist traditions. There are seven major energy centers, plus many minor ones. (My own form of energy work, Restorative Touch, posits an eighth.) Each corresponds to specific glands, organs, and facets of your being. Energy flows through the system in two ways. First, it flows up and down along the central channel, connecting each chakra. Second, it flows horizontally, in an exchange of energy with the cosmos. Disturbances in a chakra's flow of the energy can result in disturbances in a person’s health, emotions, mind, spirit, or life. Many forms of energy healing work with these energy centers. An energy healer can usually feel each of the vortexes and its relative strength. The chart below gives you an overview of each of the chakras. Below that you will find a Table of Contents for 19 other articles in the Chakra Section of The Energy Healing Site. The Energy Healing Site has a whole section devoted †o the energy centers that shape your life -- 20 articles in all. 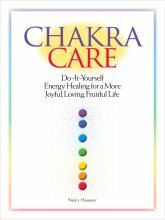 An extremely user-friendly book devoted to the chakras, with some of the clearest explanations you'll find and 500 enjoyable activities to clear, nurture and support your chakras. Learn more or buy it at the link above. 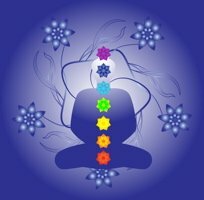 What is the color associated with each of the 7 chakras, and what do variations mean? Perceive your own subtle energy centers. Learn about keeping your subtle energy centers healthy and balanced. Learn about a common energetic phenomenon with major implications for your health. Open your chakras using fun, everyday activities. How and why to balance your energy centers. Meditation for the Chakras . How to use vocal toning to clear, balance, and energize your energy centers. How to use the power of stones and gems to clear and balance your energy centers. Chakra essential oils and how to use them for healing your subtle energy centers. Open to the love that is all around you. Speak and live your truth. Develop your capacities for clarity, intuition, and insight. Develop your capacities for spiritual growth. You might also be interested in chakra expert Anodea Judith's site, Sacred Centers.